There’s a lot of Hurricane Harvey-related news today about how the storm affected the auto industry and dealerships in the region, but please remember there is far more at stake in this situation than cars. This is kind of a selfish request from your Texan EIC, but if you are feeling generous, please go here to find ways to help the victims of this horrible and unprecedented situation that has affected the entire Gulf Coast. Houston and the Gulf region represent a major port of entry for automobiles into North America, and Texas’ highways and rail operations are a big part of how those vehicles (and parts) get to where they need to go. Buyers can expect major disruptions along those lines due to the storm. Operations for major railroads Kansas City Southern and Union Pacific remain suspended through much of Texas. Kansas City Southern, which operates a north-south network from the heartland of Mexico through the U.S. Midwest, has closed traffic lanes between Houston and Laredo, Texas, and is not accepting orders or making arrangements for deliveries in impacted areas of its network. Union Pacific, which primarily operates in the western half of the United States with Mexico service, also said it is abiding by an embargo for all traffic destined to rail yards on the Gulf Coast as well as inland points, and recommended that customers consider diverting vehicles where feasible. Operations are still suspended along the Gulf Coast from Brownsville, Texas, to Lake Charles, La., because of high water and damage from Harvey, now a tropical storm. Previously ordered or scheduled trains are being held at their origination points until further notice. Port Houston, which handled about 86,000 vehicles for Volkswagen and Fiat Chrysler Automobiles last year, remains closed. Group 1 reopened 26 of its stores in the Houston area on Wednesday morning as the company begins to “pick up the pieces” in the storm’s aftermath, said Pete DeLongchamps, vice president of manufacturer relations, financial services and public affairs. While one of its stores near a bayou in Clear Lake lost some inventory, he said most vehicles at Group 1 dealerships remained intact. DeLongchamps attributed that to the hard work stores put in last week to move inventory to higher ground on their properties before the storm made landfall. Without those efforts, he said, hundreds of vehicles would have been under water. [...] AutoNation said late Wednesday that its 18 stores and seven collision centers in Houston will reopen Thursday morning. CarMax’s six Houston stores remain closed. Everyone has bigger fish to fry at the moment, but down the line, buyers there (and elsewhere) are going to need to be extra wary of flood-damaged cars getting sold via title and VIN washing. It happens every time a natural disaster occurs, and it’s not something you want. When Houston floods, it turns into a locked circular labyrinth. The city, my home town, is laid out like a wagon wheel: downtown sits at the center, surrounded by three concentric circles, which are bisected by highways in every direction. The first loop, Interstate 610, is thirty-eight miles long, and corrals the Inner Loop neighborhoods. 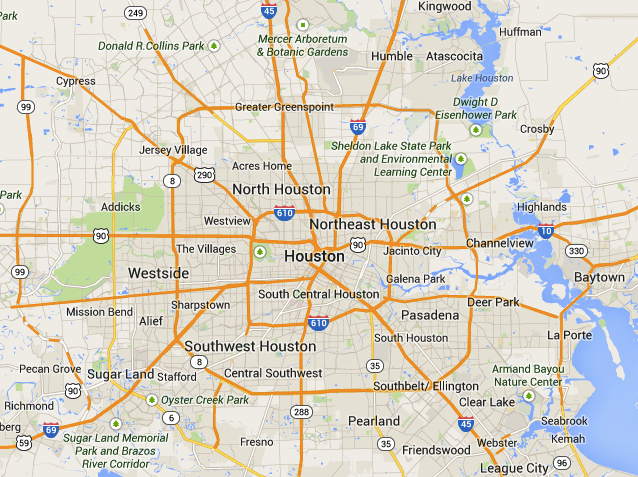 Another round of suburban neighborhoods surrounds the Loop, and is bounded by the eighty-eight-mile-long Beltway 8. Then, the truly sprawling suburbs (Spring, Sugar Land, the Woodlands) surround the Beltway. All told, the greater Houston area is gargantuan—at over ten thousand square miles, it’s bigger than New Jersey—and, with upward of six million residents, it’s far more populous and diverse than outsiders tend to guess. Houston is also, famously, largely unregulated: zoning laws are minimal, and the unceasing outward development has, with official permission, drastically inhibited drainage. The freeway system holds the city together, keeping a huge, dispersed population connected. But in a storm this lifeline becomes a trap. Houston is flat, and it sits just fifty feet above sea level; after the bayous overflow, the rain collects on the roads. When a flood hits, driving in Houston feels like a video game turned real and deadly. There are sudden impasses everywhere; ingenuity can’t save you; once the spokes of the wheel go under, there’s nowhere to go. Keep these people in your thoughts. On Monday, Trump said he would probably need to terminate NAFTA to get what he considers a fair trade deal with economic partners Mexico and Canada, and revisited his campaign promise that Mexico would pay for a border wall. Videgaray said he, U.S. Trade Representative Robert Lighthizer and U.S. Commerce Secretary Wilbur Ross agreed on Wednesday to continue with a “serious” renegotiation process. At around the same time, during a speech at a Missouri factory, Trump repeated his threat to shred the deal. Some experts in the United States argue that Trump would not be legally allowed to leave NAFTA without the approval of Congress. Good thing Trump has such a solid track record of getting legislation pushed through. Last year, Chinese companies spent a record $140 billion on global acquisitions, second only to the United States, says a study on “China’s rise in global M&A” by White & Case, a global law firm. And despite a slowing pace of deals earlier this year, Chinese investors could match or exceed the pace this year. Meaning the Chinese pursuit of assets in the global automotive industry won’t end with Tencent Holdings Ltd. taking a 5-percent stake in Elon Musk’s Tesla or Pacific Century Motors acquiring Delphi Corp.’s Saginaw-based steering division to create Nexteer Automotive Corp.
They’re just getting warmed up, Detroit. Chinese hunger to become global players, and to do it much more quickly than the methodical approaches pursued by the Japanese and South Koreans, is driving interest in FCA, for example. And buying is faster than building, which can take decades and prove more costly and fraught. The process also is being turbocharged by Chinese bureaucrats whose bias and rising quotas for electric powertrains are reshaping the global auto industry’s priorities. Why? Because China is the world’s largest market, eclipsing the United States. If you can’t build it, buy it. Maybe the Great Wall acquisition of Jeep is going nowhere, but this situation isn’t. This will definitely be a story to watch in the coming year. Neutral: Have You Ever Bought A Flood-Damaged Vehicle? Would you, even if you were getting a crazy deal on something you wanted? I probably wouldn’t, but to each their own, I guess.